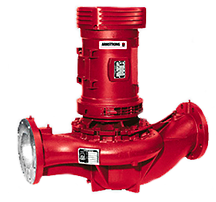 Armstrong Series 4360 & 4380 Vertical In-Line Pumps Are Built To Order. We can normally have these built and ready to ship in 2-3 days. Please provide us pictures of the data plate if available and all the specs on your current pump. Sales@NationalPumpSupply.com. The Armstrong 4360 & 4380 pipe-mounted pumps are designed for space-saving installation and long service life.